Island Packer (#251991) (1943-1969), 52-foot wood Liberty launch built for the U.S. Navy in 1943. 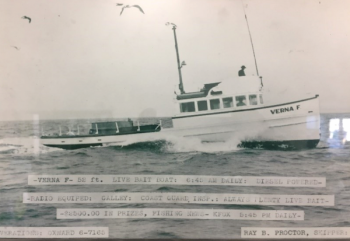 In the 1950s, she was converted to a charter fishing vessel and named Verna F. She was licensed to carry 49 passengers with a crew of three. 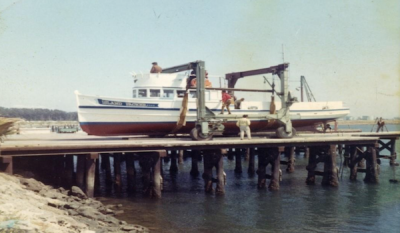 In 1968, Bill Connally, founder of Island Packers, Inc., purchased her from Kenny Lamb, owner of Ventura Sport Fishing, and renamed her the Island Packer. 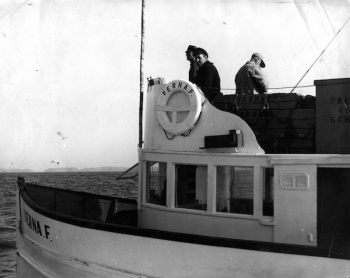 She was converted to an island transportation and tour vessel, hauling people and supplies to Anacapa and Santa Cruz islands. Four gold stars after her name represented the four Connally children, Mark, Kirk, Cherryl and Brad. Curley Oliver was her first captain. On December 8, 1969 returning from a cargo run to Albert’s Anchorage on Santa Cruz Island in a storm, Island Packer was wrecked on the north side of East Anacapa Island. Her engine quit due to clogged fuel filters. The Coast Guard was called and Island Packers was called. The Coast Guard was delayed when they ran aground on a sand bar leaving Santa Barbara Harbor. Island Packer drifted until she was anchored near the island. The weather came up. By the time the Coast Guard arrived, they attached a tow line to the vessel's Samson post on the bow, pulled out too fast and snapped the post. Coast Guard ordered the crew to abandon the vessel, and they picked up the two crew from the water. 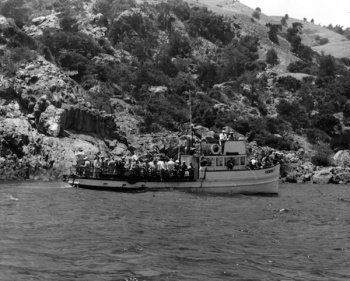 Island Packer was wrecked on the rocks. The Connallys went out the next day on the Paisano and dove for pieces of the wreck. The next vessel the Connally family bought was We Seven.